Do your supervisors know how to identify alcohol and drug abusers within your employee population? Would they know the appropriate steps to take should a substance abuser be discovered? Promoting an alcohol and drug free work place is essential for optimal productivity, safety, and overall corporate wellness, but few know how to make this happen. Protect your organization by providing your supervisors with DOT online training from WorkExcel. Much like any task, your supervisors need the right tools to properly promote an alcohol and drug free work place. That�s where DOT compliance training online comes in! WorkExcel�s program turns what can be a complex, touchy subject into an easily understandable, frank discussion about drug and alcohol problems. Your supervisors will come away knowing how to leverage this information in the workplace, which leads to a better work environment for all. DOT online training will help your supervisors identify substance abusers regardless of how subtle the clues may be. The training program will also empower your staff to take the necessary steps towards helping employees suffering with drug or alcohol problems. 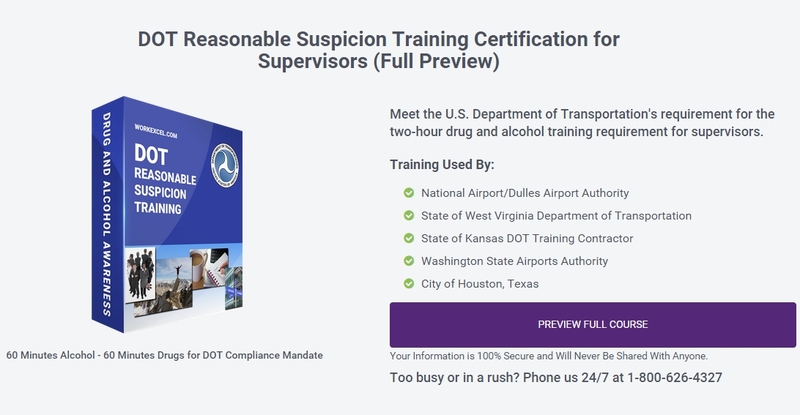 Your company is not doing everything it can to provide employees with a drug and alcohol free environment unless every supervisor has completed DOT compliance training online. Every supervisor must know how to identify the signs of substance abuse to ensure no employees are slipping through the cracks, making your business less productive with their drug or alcohol problems. The longer an employee�s substance abuse problem goes unnoticed, the longer your company will not be running at peak performance. Left unchecked, substance abuse leads to safety hazards, lower productivity, added stress, and resentment. Providing every supervisor with DOT online training is not a luxury, it�s a must! Simply put, DOT online training is convenient. Even the busiest, hardest to reach supervisors will be on their way to understanding how drug and alcohol problems present themselves in the workplace. One of the biggest advantages of having your supervisors complete DOT compliance training online is that their training can be completed anytime, anywhere. With WorkExcel�s online program, your supervisors will have 24-7 access to the most current workplace drug and alcohol training available. No preliminary study or preparation is required for DOT compliance training online. Just tell your staff where they can find the material online, and within minutes they will be on their way to recognizing substance abusers and having the confidence and knowledge to correctly address the issue. Not all DOT online training programs were created equally. While completing DOT compliance training online is the most convenient way to reach all of your supervisors, the program must meet all of your company�s specific needs. Most training programs on the market today do not offer a customizable program, and if customization is offered, the price point makes it not affordable. This leaves many companies with either a program that doesn�t provide everything they need or one that cost them an arm and a leg. Choose your training program wisely! What makes WorkExcel Different than other DOT Compliance Training Online Programs? Companies never have to compromise when they choose WorkExcel for their DOT compliance training online needs. Besides being an industry leader whose DOT online training program is used across industries in large and small corporations throughout the United States, WorkExcel provides a low-cost, high-quality, customizable training experience. WorkExcel�s online training is completely self-contained. You will have the option of having your handouts inserted into the DOT online training as printable PDFs. All of the materials provided by WorkExcel have been time-tested and will provide your supervisors with relevant, usable information on drug and alcohol abuse in the workplace. WorkExcel�s DOT compliance training online program comes complete with printable handouts, test questions, and Certificates of Completion. The WorkExcel program includes information on: addictive diseases, common supervisor myths, personal problems as symptoms, dollars and �sense� of intervention, understanding tolerance and enabling, performance signs of substance abuse, constructive confrontation of problem behavior, follow-up with employees, and much more. After completing the WorkExcel DOT compliance training online, your supervisors will be ready and able to identify potential substance abusers and take appropriate action.